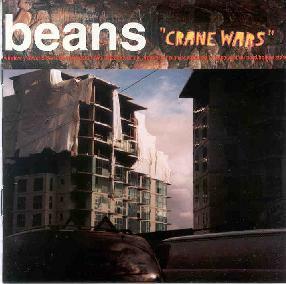 In their promo materials, Vancouver based band Beans describe themselves as a cross between Ennio Morricone and Brian Eno. Since I haven't heard much Ennio Morricone, I can't comment on that comparison, but I don't hear a lot of Brian Eno. What I do hear on Crane Wars is music that reminds me of a brighter, less intense Godspeed You Black Emperor. What I do hear is a great album, full of original and inspired post rock sounds. After a short, oddball intro of strained horns, the band is off with Window y Tower, a laidback musical odyssey of strumming rhythm, airborne, reverbed guitar leads, loose, easy percussion, and melodies that seem to evoke memories of times gone by without sounding stale or overused in the least. The sound dissolves into a pastiche of hypnotic accordian and European voices that fade in and out. Boston Rwa is another standout on an album full of standouts, a piece that shifts through textures and styles from moody guitar and drums floating on a slipstream of ambient street sounds to upbeat, almost jazzy workouts with great drumming and lovely trumpet, for its nearly 12-minute length. I Breath the Air (From Other Planets) is the oddest piece on the album, with its discordant, marching piano lines and sampled operatic vocals. The true highlight of the album comes in the form of the 9-minute Lasa-Ma in Pace begins with eerie, ambient textures that finally break out into a rousing, instrumental surf-rock-like second half that is truly amazing. The occasional intrusion of bored sounding vocals on the album is a little unnecessary, as the music has a loose, improvisational quality about it that belies the structure that lyrics try to impose on it, but they are so sparse as to be almost unnoticeable. Overall, the album is a great listen, easy to mellow out to, but also interesting enough to hold your attention from the jolting, discordant beginning through to the beautiful, holiday ending. For more information you can visit the Zum web site at: http://www.zumonline.com. Contact via snail mail c/o Zum; PO Box 4449; Bereley, CA 94704-0449.